It probably goes without saying, but Apple's naming conventions don't follow much of a pattern. For the iPhone, we had the original iPhone (#1), iPhone 3G (#2, but with a "3" in the name), iPhone 3GS (#3), iPhone 4 (#4, makes sense! ), iPhone 4S (#5, with a "4" in the name), and so on. iPods were generally just called "iPod", with new names for the different lines (i.e. "Mini", "Nano", "Shuffle"). Different lines - and different generations within each line, looked so different that they could be easily differentiated, and were often referred to by nicknames. (i.e., "Nano Fat"). Then we had the iPad, the iPad 2, and the.... iPad. Obviously, Apple doesn't want to get stuck in the "X+1 Integer" naming convention for succeeding generations of the same product. Eventually you have the "iPad 17", and it gets difficult to follow. But when it comes to the used market Apple's networking devices, it's remarkably difficult to tell, at the outset, which particular generation or version you're discussing. 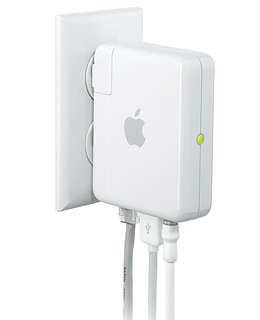 There are 2 versions of the Airport Express. They're both identical in form factor - same shape, color, logo, same LED, same ports. The first Express (model A1084) was wireless A/B/G, and the new one (model A1264), obviously, is wireless N.
I had a feeling that my $30 Express was going to be the old model - but I held out some hope, based on the description. And at $30, I didn't care too much - it was a good price either way. Even when I'd confirmed that it was, in fact, a A1084, I still bought it. After all, I still have some wireless G items on my network, and for music streaming, this would help more than it hurt, right? But when I got home, I noticed some serious drawbacks to the Express A1084. Obviously, no wireless N. But more importantly, it doesn't interface with Airport Utility 6.0. At all. It can't be recognized by your network if you're running 6.0 - you'll just see the amber light. If you intend to use an A1084, you have to download and use Airport Utility 5.6 to configure it.... which is not something I intend to do on my iMac - networking is confusing enough as-is without running parallel versions of the same utility. You also can't use it as an ethernet-to-wireless bridge. Fortunately, I was able to flip the A1084 on eBay in about 10 minutes, for a buy-it-now of $35. Lesson learned, and I made $5 in the process. Thanks, Matthew. Love your blog. I've been trying to figure out why I am getting such slow speeds with my Airport Extreme (2nd Generation) after having Comcast Blast! 105 Mbps service installed. With a Mac Mini connected to the Airport via ethernet I am getting about 80 Mbps, not bad considering it's six times faster than a T1 line. I can accept it, no complaint other than: Comcast is such a deceptive and sleazy company that with the worst customer service, for the most part. The problem is wireless. I am getting about 25% the speed with Airport, i.e., 20-30 Mbps, from a server only 70 miles away. Still, that's pretty damn fast considering. But, I'm a person who wants to get the most out of all this technology, I want to see it working at its optimum best. I have used Mavericks' wireless diagnostics, read many forums and so on in order to tweak my configuration for the best speeds. Currently I am using 2.4 Ghz 802.11n only with the wireless channel set at 11. So far all the various different wireless settings have not made any radical difference, and this one seems to be the best of the lot. In order to try to improve upon these speeds I just bought a 5th Generation Airport Extreme on eBay for $50 including shipping. Seems like a fair price, if it is really not overly used as it said in the listing. I tend to think it won't make a real difference but we will see and I will let you know if it does. Thanks, Alan! I'm looking to upgrade both my Airport Extreme and my home internet speed in 2015. I had been considering Comcast 105 mbps, too - interesting that you're not seeing anything close to those speeds in real life. Thank you for these evaluations of different Airport Extreme and Express versions.